Lorraine and Wal Smart singing “Hello Dolly” with other CADS members during a dress rehearsal. Photos: Supplied. In cars with fogged-up windows by the road’s edge from Goulburn to Crookwell they wait excitedly for Desley Rowley’s champagne coach. 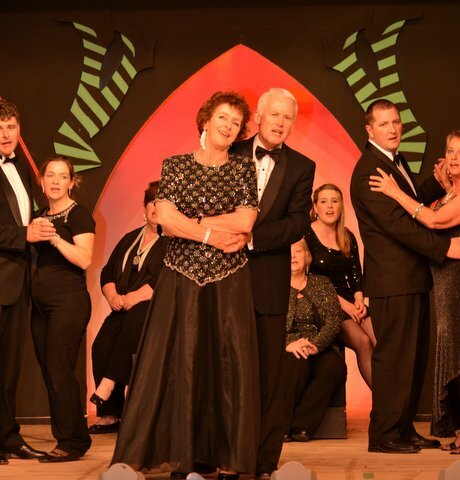 The bus stops for ticket-holders to Crookwell Amateur Dramatic Society’s music hall productions. The 56-seater has a bottomless glass of champagne, served with Desley’s famous Cote d’Or chocolates and fresh strawberries. Theatre-goers from Sydney, Wollongong and Canberra climb aboard in Goulburn. 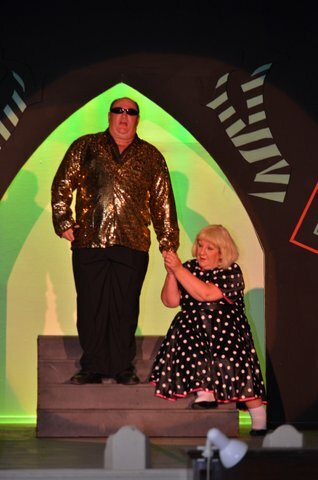 Delsey is a patron of CADS, and organises the coach, driver and tables for basket supper performances. Thirty of CADS’ leading characters have responded to director Anne Cleary’s call for a special show to honour musical director Helen Campbell who turned 90 in February. Everyone has vowed to knock themselves out because this will be their last hoorah on stage. Darren ‘Buckets O’Brien’ with Rhonda Cummins. Most players are coming from the halcyon days of CADS in the 1990s. That’s when former Green Devils rugby league hard man Darren ‘Buckets’ O’Brien was tricked into attending a rehearsal with a mate. Once inside the hall, his mate bolted, leaving Buckets to find fame – and he did. Anne says Buckets’ timing for comedy is the best she has seen. He had taken a redundancy from Telecom, and was a publican when he joined CADS. Buckets shrugs off his talent. “I was a bit of a larrikin, a family trait,’’ he says. Another night, taking a bow after his Elvis impersonation, a bra appeared through the glow of the stage lights, landing at his feet. “I’d obviously missed my calling,” Wal muses. Superb performers included Michael Lowe, fresh from high school and son of CADS’ other musical director, Helen Lowe. “Michael has been the best male singer we have ever had,” Anne said. Everyone is nearly 30 years older than those earlier CADS hits. A melodrama, The Tram Track Tragedy, so popular in 1992, will be revived in the latest musical. It starred Heather Davies, Christine Bentley, Chris Croker, Michael Lowe and Des Storrier. After two months of rehearsals, Back to those Musical Days will open on Friday night, June 21, the first of six performances. The champagne bus leaves Goulburn on June 22 and June 29. Tickets will go on sale for $20 and $25 through Crookwell Visitor Information Centre or trybooking online.